Introduction: In this article, Scott Phillips starts off searching old newspapers for clues to help him find his ancestor’s birth record—and finds so much information that he ends up filling out a new branch of his family tree! Scott is a genealogical historian and owner of Onward To Our Past® genealogy services. We all know the frustration we feel when, in working on our genealogy, we can’t find an elusive—but important—vital record for one of our ancestors. I suggest that one good approach is to search for genealogical clues in the historical newspapers from your ancestor’s era. The good news is that, at times, these clues are waiting to be found in all kinds of locations throughout the newspapers. Let me give you a few examples of what I mean, based on searches I’ve done in GenealogyBank’s Historical Newspaper Archives. While I have a wealth of information on one of my first cousins twice removed, Joseph Vicha, I have been unable to find his actual birth document to verify the year he was born. So I set out to see what clues to his birth I might find in the newspapers. My first discovery was this divorce notice in an 1899 Cleveland newspaper, which provided me with two very useful genealogy clues. 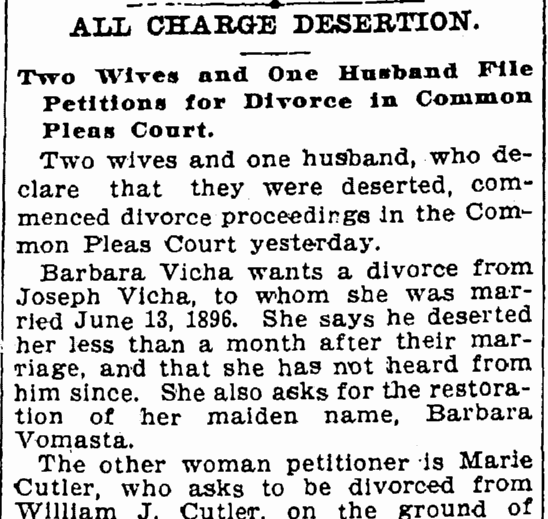 It seems that Mrs. Barbara Vicha was seeking a legal separation, divorce, and alimony from Joseph Vicha. This old news article not only lists their wedding date as 13 June 1896, it also notes that Barbara was seeking the return of her maiden name of Vomasta. These two clues—her maiden name and their wedding date—enabled me to do a follow-up search at Ancestry.com, where I found the marriage license for their marriage—which in turn gave me the additional information of the year of his birth! As is so often the case in genealogy, I then became interested in finding out more about not only Joseph, but his wife, Barbara (Vomasta) Vicha. One thing led to another and, several hours later, I had learned a substantial amount about this interesting family. It was like opening a picture window to life in the early Czech community of Cleveland, all through one family. As I continued my genealogy research I discovered that Barbara remarried after her divorce from Joseph. Not surprisingly it was to another Czech, with the surname of Vlk. I then did a search on Barbara Vlk and found this helpful obituary in a 1936 Cleveland newspaper. It is for a man named John Vonasta [Vomasta], and mentions that he was the “beloved brother of Barbara Vlk.” This obituary also lists two nieces, complete with their married names: Edna Carroll and Gladys Baldy [Baldi]. I followed up these clues with a search of one of the City Directories for Cleveland, Ohio, dated 1891. In it I read that while the head of the household, Vaclav (later James) Vomasta, was a laborer, his son John Vomasta was listed as a cigar maker. Both were reported as living on Rock Street, which was deep in the heart of one of the largest Czech neighborhoods in Cleveland. It must have been a hardscrabble life for Vaclav since in the 1910 U.S. Census he is listed as a “(street) shovel” at the age of 65. There was another clue in John Vomasta’s obituary. Did you notice that last line? It reads: “New Haven (Conn.) papers please copy.” This was the Cleveland editors’ way of letting the New Haven editors know this obituary would be of interest to their own readers. Why would a Cleveland cigar maker’s death be of interest to readers in New Haven, Connecticut? This led me to additional searches, in which I discovered that John Vomasta was listed as a tenant in New Haven, Connecticut, in the 1920 and 1930 U.S. Censuses. I wondered why a cigar maker might be drawn to New Haven, Connecticut—and so I did a bit of searching on the cigar industry there. GenealogyBank’s newspapers did not disappoint me as there were literally hundreds of search results on this topic. It seems that there was quite a flourishing cigar industry in New Haven in the late 1800s and early 1900s. One example is this article from an 1899 New Haven newspaper. 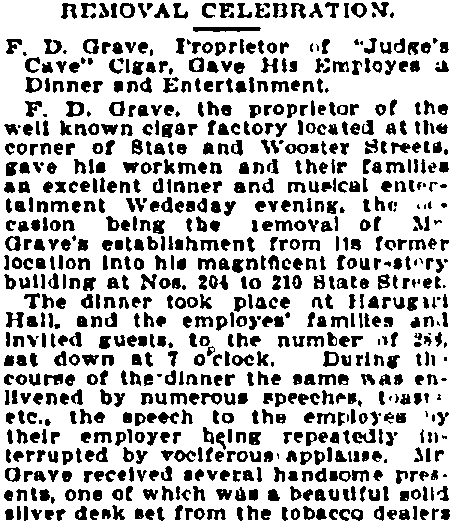 This article features F. D. Grave and his “Judge’s Cave” Cigar company. The occasion was the imminent move of his “well known cigar factory” to a “magnificent four-story building at Nos. 204 to 210 State Street,” and the “excellent dinner and musical entertainment” he gave for his 285 employees to celebrate the move. Could this have been where John Vomasta worked? After all, the 1920 and 1930 U.S. Census returns for him list his address as 440 State Street, just up the street from F. D. Grave’s cigar factory. As I continued researching this family, I discovered a variety of life’s occurrences. One of the daughters, who was once Gladys Baldi, had remarried—only to have this husband tragically die in an automobile accident slightly less than 14 months after they were married. Wanting to be complete in my genealogy research, but not expecting to find much from a marriage of less than 1 ½ years, I was interested when I found this 2001 obituary for Gladys K. Glaser in a Kansas City newspaper. This obituary provided me with the fact that, in spite of the short duration of her second marriage, their union produced a daughter, in addition to the son she had from her first marriage. I also learned that at the time of her passing she had seven grandchildren, six great-grandchildren, a nephew—and her sister Edna was still alive. Plus those seven grandchildren and six great-grandchildren to track down! Just think: I began this search looking for one simple vital statistic that I found to be elusive: the birth year for my relative Joseph Vicha—but came away with a whole new branch of our family tree growing right before me, and many more clues for additional family history research. Now before I get back to looking for Joseph Vicha’s birth document—which is what I started off trying to find and would still like to track down—let me ask: what have been some of the best clues in historical newspapers that you have found for your genealogy and family history?